Posted on November 30, 2018 at 1:10 pm. Ashlawn‘s fourth grade math team of Katie Teague, Hannah Magnolia, Amy Slavin, Meggie Scogna, Estella Tice, and Donna Bertch hosted a Multiplication Night for Ashlawn parents to experience what fourth graders are learning in math. Parents were taught multiplication strategies, partial products, the box method, number talk and number sense. 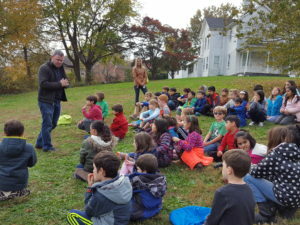 Randolph’s annual Young Authors and Illustrators Day was celebrated on Oct. 12 with a visit from Jacqueline Jules (author of the Freddie Ramos and Sophia Martinez series) and Madelyn Rosenberg (author of This Is Just A Test). 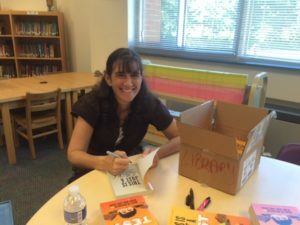 Students in grades K-3 learned about storytelling and the writing process with Jules, while students in grades 4-5 learned about historical fiction and the editing process with Rosenberg. Jayla Parks, a librarian at Columbia Pike Library, offered a special program for preschoolers in the library. Yorktown received a donation of 10 CPR mannequins from the American Heart Association recently. Students in Health & Physical Education classes will be learning CPR this year. 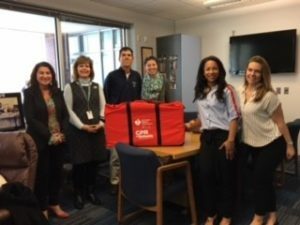 The CPR mannequins were received by Yorktown Principal Bridget Loft, Athletic Director Michael Krulfeld, and Health/Physical Education Department Chair Claire Shreeve. Jefferson eighth graders explored a variety of careers on Mon, Nov. 19. Community members from careers ranging from health and human services to business management and administration came to share their experiences with the students. The next day, the inspired students visited a variety of nearby colleges and universities, including Howard, Gallaudet, American and George Mason. Counselor Tiffani Woody-Pope and IB Coordinator Kip Malinosky led the coordination efforts. 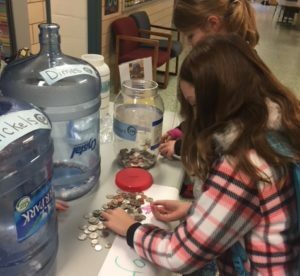 On Nov. 26, Taylor siblings, Timothy and Logan Abbott, donated $66 to the school’s Coins 4 a Cause campaign Nickels 4 Niger. 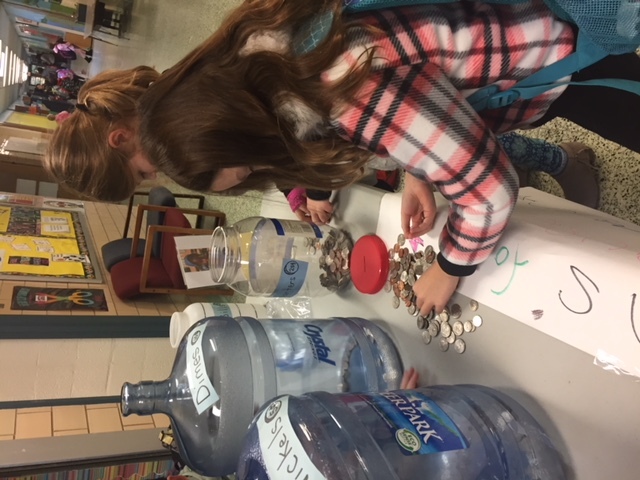 The two students happily sold cookies in their neighborhood during the Thanksgiving holiday so that the money raised could go to support a first grade student in Niger, Africa who Taylor is sponsoring. As part of Henry’s 2019 Commemoration Schools Celebration, students and staff participated in the “Thanksgiving Chain” activity to help cultivate an “attitude of gratitude.” Henry students and staff were invited to write what they were thankful for on a paper link, and the Thankful Chain was created. 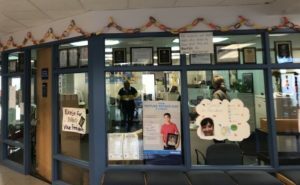 The chain spanned the walls on the front lobby and was a visible reminder of all the things for which we are thankful! 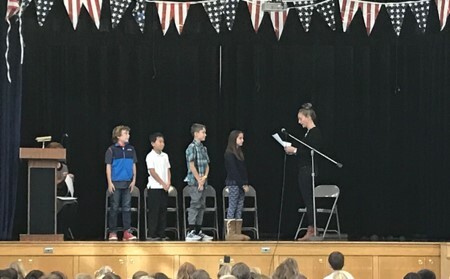 Jamestown held an induction ceremony for students elected to the Student Council Association. 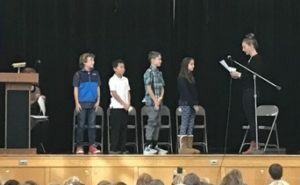 Each member took an oath of office pledging to uphold the values of their school and country and to do the job to the best of their ability. Classroom representatives also were recognized at the ceremony. Barcroft Elementary School students and families generously donated some of their Halloween candy to Treats For Troops. 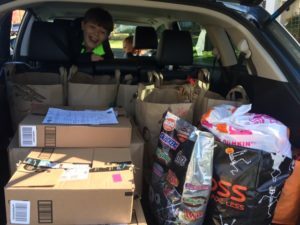 More than 235 pounds of candy was delivered to the Washington DC VA Medical Center. The Career Center family celebrated Thanksgiving in a variety of special ways. First, the Program for Employment Preparedness (PEP), Teen Parenting Program, HILT Institute, and the Auto Tech/Collision Repair teams prepared family meals for their students. It was a great way to experience Thanksgiving, especially for our newly arrived students. Second, students from the different Career Center programs provided “thankful “ inputs to the ACC Hands of Gratitude turkey work of art. Finally, the celebrations of many students and staffs enjoyed a special touch, as the Culinary Arts program students sold a variety of delicious Thanksgiving pies. The Fiesta Salad celebration at Ashlawn on November 14 was a big success! Thanks to Ashlawn students and neighbors who planted organic greens and harvested a beautiful crop, some 900 Ashlawn students and staff enjoyed a huge, multi-ingredient healthy Fiesta Salad last week. Ashlawn also shared a portion of the crop with the Arlington Food Assistance Center. Three cheers for everybody who helped plant, wash and serve the Fiesta Salad! Stratford is very fortunate to be affiliated with Safeway. 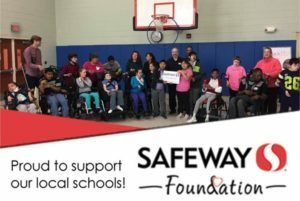 This year, Stratford was part of the 2018 Safeway Foundation School Spirit campaign. 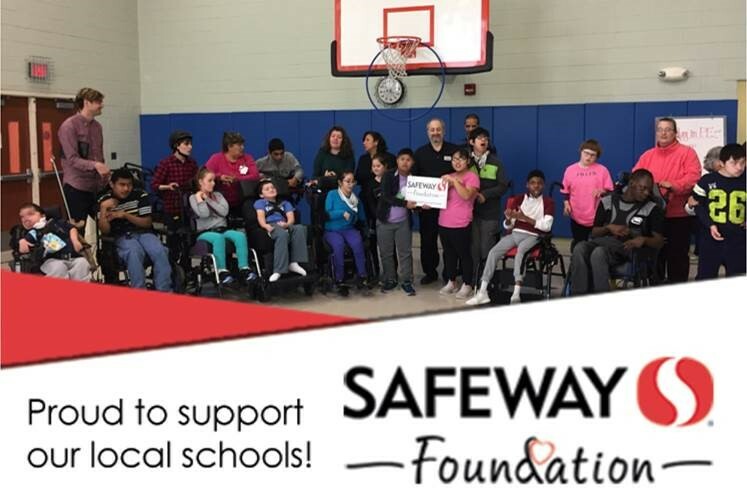 Safeway sent a check for $2,200.43 to benefit the Stratford Special Education Program. Ed Mensh the Safeway store manager met with staff and students to present the ward. 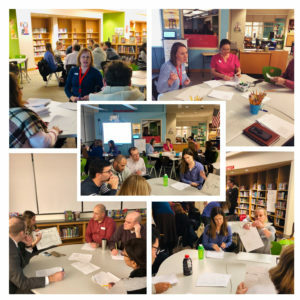 This is a definite relationship that benefits our local schools and overall the entire Arlington community. A group fourth grade students spontaneously gathered in the cafeteria to chant, “Go Navy!” What was all the excitement about? 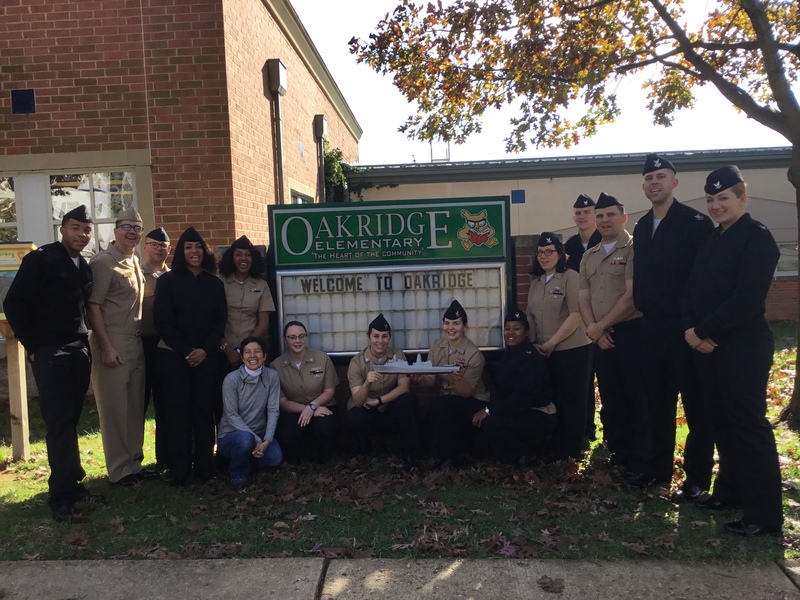 Fourteen crew members from the USS Arlington Navy Amphibious Ship, Oakridge Elementary School’s newest partner, were on site and students were pumped! The fact that one of the 14 crew, OS3 Reid Shafer, is Kindergarten teacher Sally Shafer’s son, added to the excitement. This amazing group started the day by leading the entire school with The Pledge of Allegiance. Extended Day students, kindergarten and second grade students were mesmerized by the crew who introduced themselves and then answered a variety of questions ranging from how the defense missile system on the ship works to what the various parts of the uniform mean. 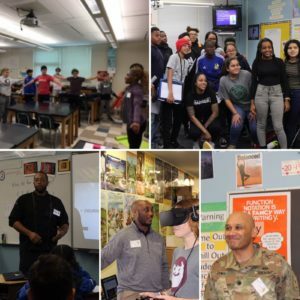 The USS Arlington crew engaged students with active brain energizer exercises, a reading of their favorite books, recess time on the playground, and lunch together in the cafeteria. The bonds formed between crew, students and staff were immediate. Tina Oxendine’s second graders wrote welcome letters for crew to take back and share with fellow sailors on the ship and James Proctor’s class mailed thank you letters to the visitors. ESOL/HILT teacher Susan Tucker and LT Saul Burleson shared stories about an overseas base where they had both, at different times, been stationed. 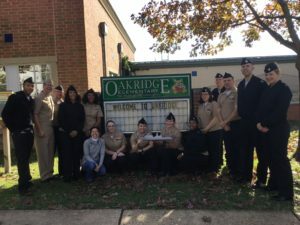 The USS Arlington is generously donating t-shirts for Oakridge PTA’s upcoming Winter Family Fitness event and plans to involve Oakridge in their United Through Reading Program. Students and staff intend to stay in touch through a Pen Pal exchange and hope to surprise the sailors with future care packages. Also in "School News Roundup"